A list of hidden gems in Databox that will help you understand how your business performs day-to-day. Since the launch of Databox, we have been constantly adding new features to help you better understand how your business performs day-to-day. Because you might not know these features exist, we made a list of hidden gems that will make you and your team more efficient. Cumulative is the sum of all values occurring in a sequence. In Databox, every line or bar chart can be transformed to show values for a period as a cumulative sequence. Cumulative charts are perfect to monitor the KPI performance compared to previous period. How can I switch to a cumulative chart? Save the change and see the result. Gauge is a brand new Datablock visualization perfect for monitoring how you’re doing against your goals. A goal value can be set as a fixed number or another metric. Pretty cool, right? Define a metric you would like to track on the gauge and then select the target value (fixed number or another metric). You have only one screen but would like to display many Datawalls? No problem, you can see all of them by using the carousel mode. What’s that? Carousel mode will automatically loop through your Datawalls. You can define how fast you would like the transition between them. Save the changes and the Datawalls should start to slide right away. As you may know, the Databox platform also includes an Apple Watch app to go along with your mobile app. There is no faster way to access your crucial metrics than to raise your wrist and check them out in the watch app. It also happens that the watch app offers complications—tiny bits of information available right on your watch face. You’ll never have to spend more than a few seconds to know how your key metric is doing. To set it up, make sure you have the watch app installed. To check that, take your iPhone and go to the Watch app and find Databox on the list. Make sure the switch is on “installed”. Next, tap on the “Dock” and drag Databox from “Do not include” up to the first section. That’s it for the iPhone part. On your watch, force press the watch face and tap edit. From complications select “Databox” and you’re good to go. The complication always shows the first metric you have in your Favorites (the star icon) in your Databox iOS app. Databox for Slack brings business insights directly to Slack conversations. You and your team are able to view data in context, right where your current conversation is taking place. The Daily Scorecard and Weekly Summary are one of the most essential features in Databox that will help you understand how your business changes on a day-to-day and week-to-week basis. Click on your avatar in the top right corner to open the account options and select “My profile”. Check the “Slack notifications” option and click Save. The delivery can be set individually for each alert. Alerts can be delivered via email, push notification to your mobile app, or Slack. To turn on delivery to Slack, edit each alert by logging into the Databox web application and click on Notifications. You will find your alerts listed. To edit an alert click “Edit” on the right side and check the “Slack” delivery option. Save the alert. Now you’ll be up-to-date with your business metrics without leaving your chat. Do you have a Google or LinkedIn account? Pretty sure you do. We added support for LinkedIn and Google Sign-in, so from now on you can log in to the web app and mobile devices with just a click. How can I link a Google or LinkedIn account to an existing Databox account? From there you can add your Google and/or LinkedIn account to log in to Datawall web app and Databox mobile apps. Is there an organization out there nowadays that doesn’t use some kind of an SQL database? Very unlikely. When data needs to be structured and stored in an organized manner, SQL is likely the tool to use. At the moment, MySQL, PostgreSQL, Microsoft Azure SQL, and Amazon Redshift are supported out of the box in Databox. You have the data ready in your database, now it just needs to get visualized in an easy and concise manner so that everyone – even your boss – can understand it. Go to Available data sources option and find your SQL Database tile. Right now, SQL connectors are still in beta so you will need to check the Beta checkbox on the bottom right to see them. We have detailed tutorials for MySQL, PostgreSQL and Amazon Redshift to help you get started. The ability to share metrics, charts and views on Databox helps you solve critical problems faster by instantly including your team in the discussion. Whenever you see something out of the ordinary, tap the share icon in the upper right-hand corner of the screen and create a data snapshot. A new screen will appear prompting you to choose people with whom you want to share this data. You can start typing names of your colleagues already in Databox and the app will automatically suggest who you can reference. People you’ve entered explicitly will receive a push notification and others will just see this message in their activity feeds. You can also enter email addresses of people who aren’t in Databox and they will receive your snapshot via email. Optionally, you can also annotate the snapshot to emphasize the data you want to discuss. Immediately after you’ve shared your snapshot, it will be transformed into a conversation that will show up in your Activity section. Once a recipient opens up the conversation, the app will track him or her and include them in the Seen by section. Yes, you can do that on mobile too! Go to the Profile tab, open the “Datacards setup” and scroll to the bottom of the list where you can “Create a New Datacard”. The setup process from here onwards is the same as in the web app: first select a data source, then your metrics, and in the end you connect the data source. Each datablock has a main interval (the primary date range for data visualization) and the option to add additional intervals (except ‘Main’ and ‘Interval’ datablocks). 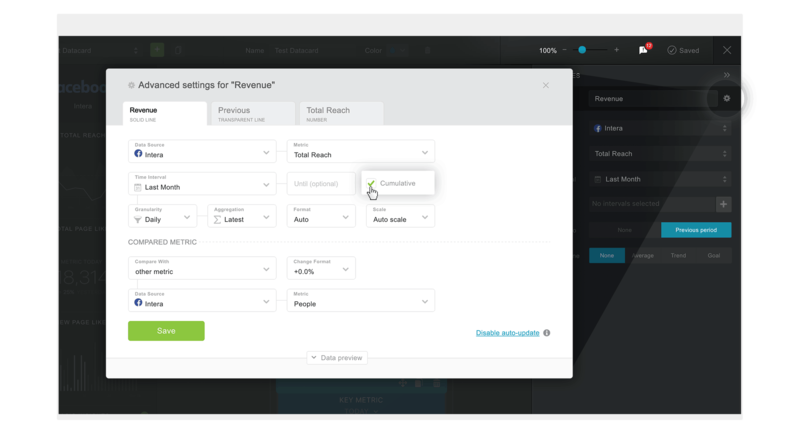 Additional intervals give you the ability to switch the date range for the selected metric to drill down your KPIs. Read here an article about adding and modifying intervals. Additional intervals are supported both for mobile Datacards and Datawalls. To easily switch between date ranges, you can tap on the arrow and expanding additional block options. Tip: On a table and big number datablocks you can just tap (click) anywhere on the block to switch the interval. Gasper Vidovic is Director of Product at Databox. Also a traveler, lawyer & icon enthusiast. Join 25,512 subscribers to receive latest posts. We won’t spam, ever. It only takes a click to unsubscribe. You shouldn’t have to click ‘back’ in order to navigate to your Databoards. 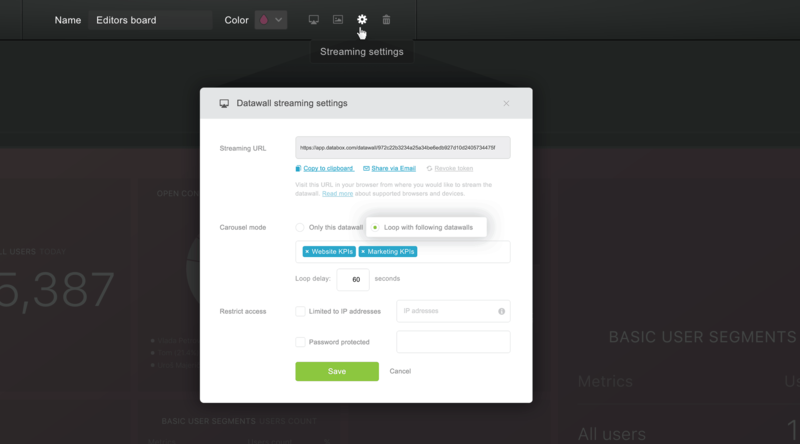 Now, you can view and switch to other Databoards in your account without interrupting your workflow. The Google Sheets Integration is Live! Turn your Google Spreadsheets into interactive dashboards that are available on desktop, office TVs, and your mobile devices. Scheduled Snapshots now supports both JPG and PDF formats. Now, your team and/or clients will receive your reports in a way that’s accessible, no matter what. 2019 © Databox, Inc. All Rights Reserved.